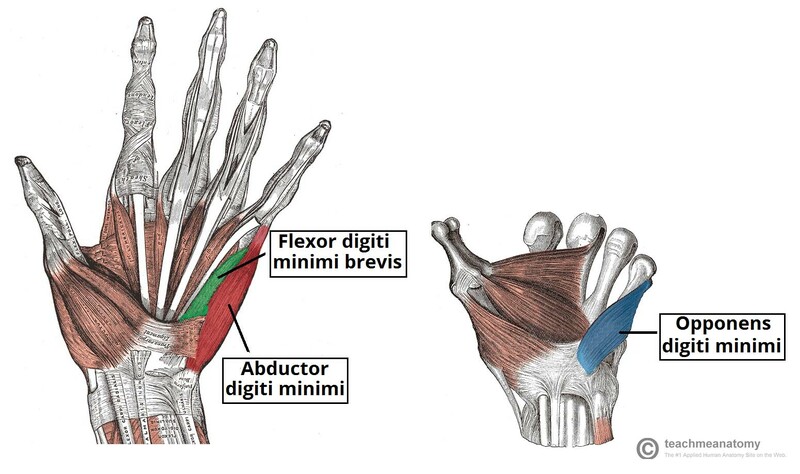 Muscles acting on the hand can be divided into two groups: extrinsic and intrinsic muscles. The extrinsic muscles are located in the anterior and posterior compartments of the forearm. They control crude movements and produce a forceful grip. The intrinsic muscles of the hand are located within the hand itself. They are responsible for the fine motor functions of the hand. In this article, we shall be looking at the anatomy of the intrinsic muscles of the hand. These include the adductor pollicis, palmaris brevis, interossei, lumbricals, thenar and hypothenar muscles. The thenar muscles are three short muscles located at the base of the thumb. The muscle bellies produce a bulge, known as the thenar eminence. They are responsible for the fine movements of the thumb. The median nerve innervates all the thenar muscles. The opponens pollicis is the largest of the thenar muscles, and lies underneath the other two. Attachments: Originates from the tubercle of the trapezium, and the associated flexor retinaculum. It inserts into the lateral margin of the metacarpal of the thumb (i.e. the first metacarpal). Actions: Opposes the thumb, by medially rotating and flexing the metacarpal on the trapezium. This muscle is found anteriorly to the opponens pollicis and proximal to the flexor pollicis brevis. Attachments: Originates from the tubercles of the scaphoid and trapezium, and from the associated flexor retinaculum. Attaches to lateral side of proximal phalanx of the thumb. The most distal of the thenar muscles. Attachments: Originates from the tubercle of the trapezium and from the associated flexor retinaculum. Attaches to the base of the proximal phalanx of the thumb. Actions: Flexes the metacarpophalangeal (MCP) joint of the thumb. Innervation: Median nerve. The deep head is innervated by the deep branch of the ulnar nerve. Figure 1 – Palmar view of the thenar muscles. The hypothenar muscles produce the hypothenar eminence – a muscular protrusion on the medial side of the palm, at the base of the little finger. These muscles are similar to the thenar muscles in both name and organisation. The ulnar nerve innervates the muscles of the hypothenar eminence. 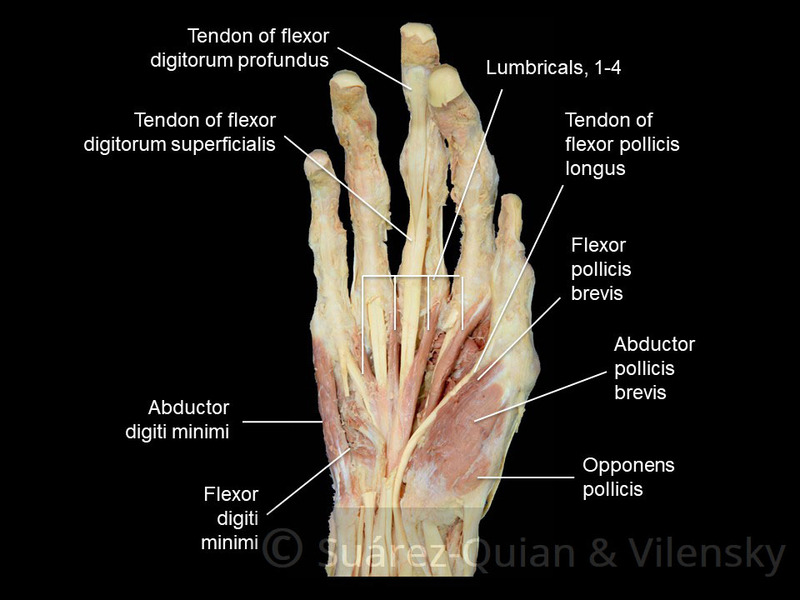 The opponens digit minimi lies deep to the other hypothenar muscles. Attachments: Originates from the hook of hamate and associated flexor retinaculum, inserts into the medial margin of metacarpal V.
Actions: It rotates the metacarpal of the little finger towards the palm, producing opposition. The most superficial of the hypothenar muscles. Attachments: Originates from the pisiform and the tendon of the flexor carpi ulnaris. It attaches to the base of the proximal phalanx of the little finger. Actions: Abducts the little finger. 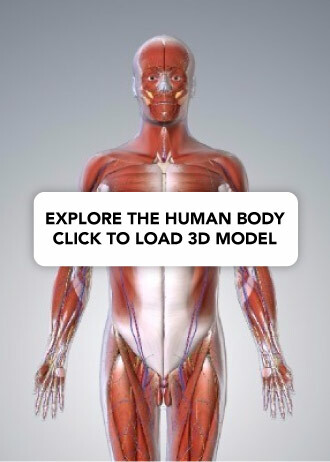 This muscles lies laterally to the abductor digiti minimi. Attachments: Originates from the hook of hamate and adjacent flexor retinaculum, and inserts into the base of the proximal phalanx of the little finger. Actions: Flexes the MCP joint of the little finger. These are four lumbricals in the hand, each associated with a finger. They are very crucial to finger movement, linking the extensor tendons to the flexor tendons. Denerveration of these muscles is the basis for the ulnar claw and hand of benediction. Attachments: Each lumbrical originates from a tendon of the flexor digitorum profundus. They pass dorsally and laterally around each finger, and inserts into the extensor hood. Actions: The flex at the MCP joint, and extend at the interphalangeal (IP) joints of each finger. Innervation: The lateral two lumbricals (of the index and middle fingers) are innervated by the median nerve. The medial two lumbricals (of the little and ring fingers) are innervated by the ulnar nerve. Figure 3 – The lumbricals of the hand. Note the differing unipennate and bipennate structure. The interossei muscles are located between the metacarpals. They can be divided into two groups: the dorsal and palmar interossei. In addition to their actions of abduction (dorsal interossei) and adduction (palmar interossei) of the fingers, the interossei also assist the lumbricals in flexion and MCP joints and extension at the IP joints. 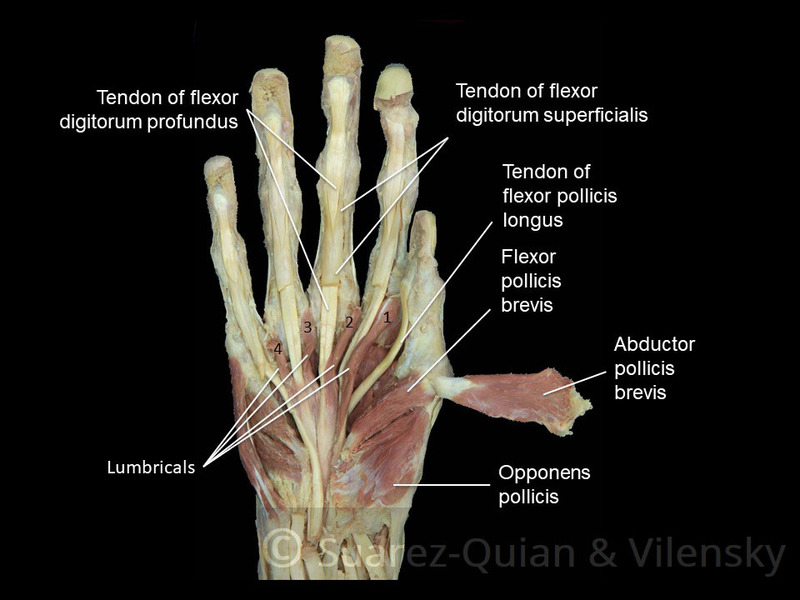 The most superficial of all dorsal muscles, these can be palpated on the dorsum of the hand. There are four dorsal interossei muscles. Attachments: Each interossei originates from the lateral and medial surfaces of the metacarpals. They attach into the extensor hood and proximal phalanx of each finger. Actions: Abduct the fingers at the MCP joint. These are located anteriorly on the hand. There are three palmar interossei muscles – although some texts report a fourth muscle at the base of the proximal phalanx of the thumb. Attachments: Each interossei originates from a medial or lateral surface of a metacarpal, and attaches into the extensor hood and proximal phalanx of same finger. Actions: Adducts the fingers at the MCP joint. 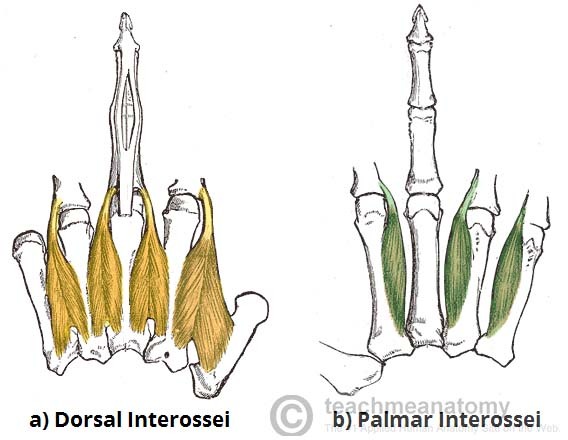 Fig 4 – The dorsal and palmar interossei of the hand. This is a small, thin muscle, found very superficially in the subcutaneous tissue of the hypothenar eminence. 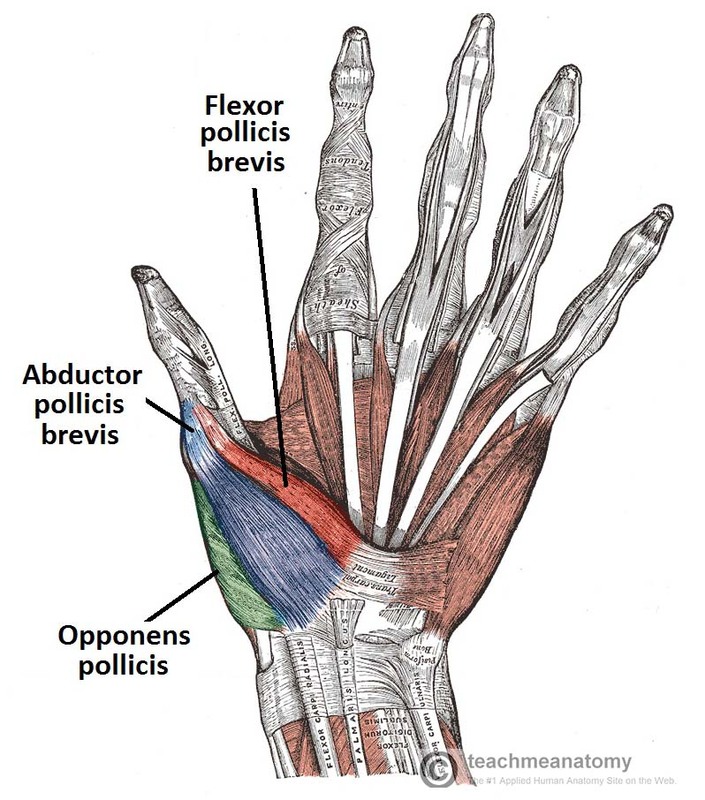 Attachments: Originates from the palmar aponeurosis and flexor retinaculum, attaches to the dermis of the skin on the medial margin of the hand. Actions: Wrinkles the skin of the hypothenar eminence and deepens the curvature of the hand, improving grip. This is large triangular muscle with two heads. The radial artery passes anteriorly through the space between the two heads, forming the deep palmar arch. Attachments: One head originates from metacarpal III. The other head originates from the capitate and adjacent areas of metacarpals II and III. Both attach into the base of the proximal phalanx of the thumb. Actions: Adductor of the thumb. 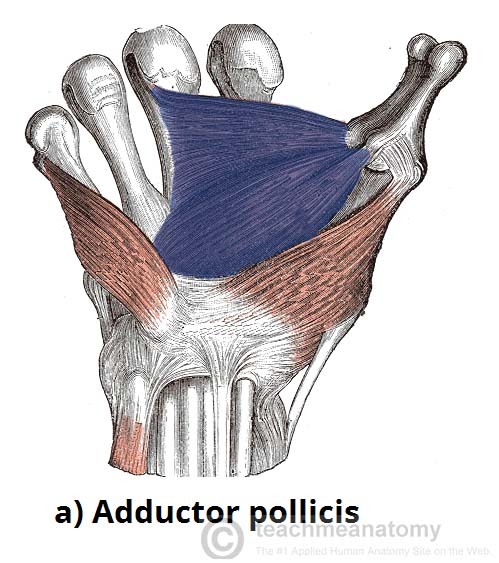 Fig 5 – The adductor pollicis. Note the two heads of the muscle. Prosection 1 – Muscles of the thenar and hypothenar eminences. Prosection 2 – The lumbricals of the hand. 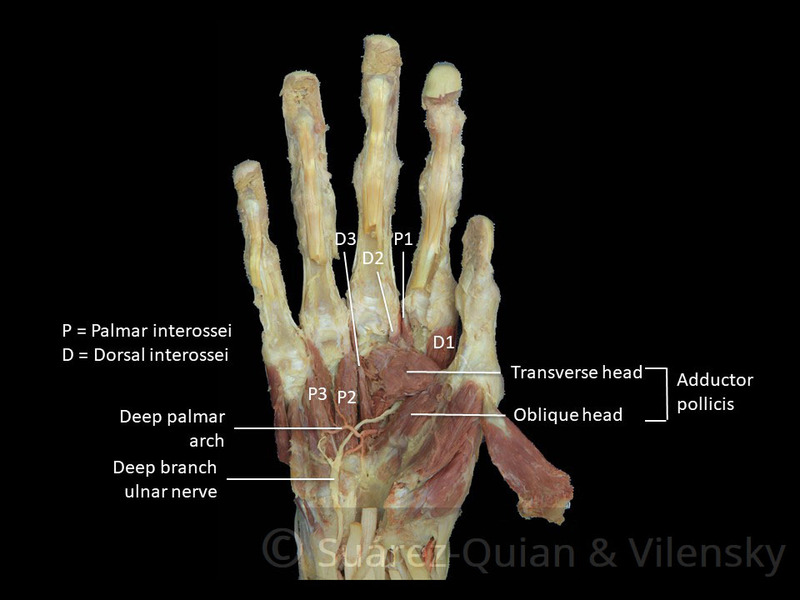 Prosection 3 – The interossei and adductor pollicis of the hand. 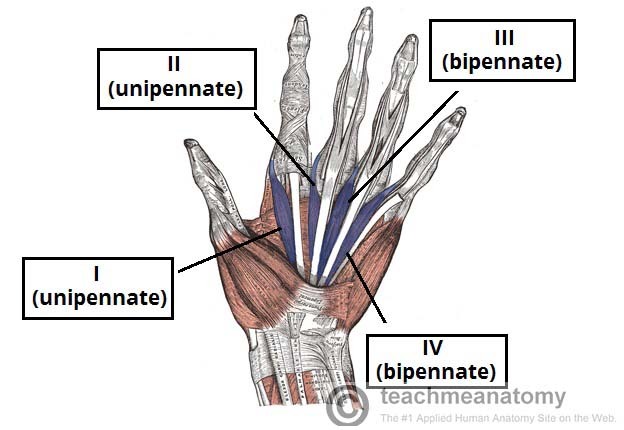 Which of the following is an intrinsic muscle of the hand? Which nerve innervates opponens digiti minimi? What is the action of the lumbricals on the interphalangeal joints?